Pressures from globalization and the knowledge-based economy and society are transforming the traditional role of universities. Utilization of scientific achievements and knowledge by national economy would be more effective if the way of cooperation between the University and industries was found. It could direct University towards the achievement of specific objectives aimed at upgrading products quality, their competitiveness and export potential. 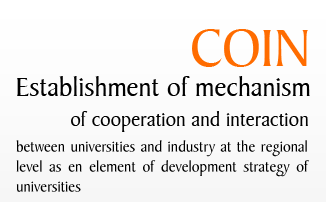 The main objective of the project is to provide theoretical and practical knowledge to prepare universisties to their new role and tasks in response to the changing environment and globalisation, to the needs of the labour markets, as well as to the role of partners in the development of their regions and local communities through establishing links and cooperation with industry.